Home » Travel Swag Contest! WIN a Camenae Travel Clutch! Wednesday I wrote about how you can make career connections while you are traveling on your career break; it just takes a little networking and you may be able to line up your next job after your career break travels are finished! I was able to do this when I was in Sinagpore and met the women who own/run CAMENAE – a luxury Italian handbag company. Jill and Brittany, my part time employers, have always supported the work Michaela and I do on Briefcase to Backpack. They are avid travelers and both have been living overseas as expats for years. They were nice enough to offer one of their classy CAMENAE travel clutches for free to one of our lucky Briefcase to Backpack readers! Whether you are traveling for a career break or for business – you still have to comply by all of the airport regulations. In most countries this means you can’t have any liquids loosely hanging out in your carry on bag – they must be contained. What better way to contain those liquids than with the CAMENAE Travel Clutch! 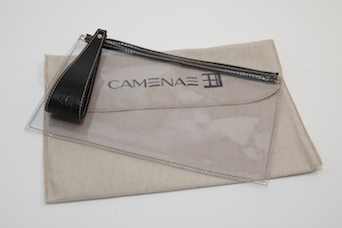 It’s time to throw away those ugly zip lock bags and travel in style with the CAMENAE travel clutch! it can be used as a travel case, clutch, make-up case, or ipod case for the beach; you’ll be traveling in style and saving the environment from those plastic bags! To win you very own CAMENAE travel clutch you simply need to do TWO simple things…but you have to do both…else you won’t be eligible to win! 1. Become a fan of CAMENAE on Facebook where you’ll get some behind the scenes information about their designs, photo shoots, and new collections. 2. Leave a comment on this post (below) describing why you’d like to win the CAMENAE Travel Clutch! Simple right?! Do both before July 5th, 2010 and you’ll be eligible to win! 15 Comments on "Travel Swag Contest!" These look fantastic! I would love to win one. As someone who travels with a lot of photo gear, I always have little bits and pieces floating around in my bag. Taking things in and out at security is always a pain. This looks like a handy and stylish way to carry everything I need to on-board! Great !! Will be great product to promote with our customers..
Good idea! Now a facebook fan of Camenae! I would LOVE one for my upcoming briefcase to backpack type trip! Great way to to stay organized as well! Those bags are SO AWESOME! I’m an avid traveler (or at least as much as I can with a 9-5 job) and am beginning my journey into travel photography. It’s my passion so that will be a big lifestyle change when (not if!) I get it off the ground. These will help with all the trips I’m planning on taking. Oh my, how stylish I would be if I rocked through the security gates with one of these! Just started my digital nomad dream and have found glad bags to be somewhat of a nuisance already. They’re not the right size so I have 2 small ones but I can’t carry them both through security because the guys says, ‘Scuse me madam, but only one bag’… Argh! They’re both still within the limit but it looks like I have twice as much! And I’m going to have to do SO many more check-ins in the next few months, this little beauty will make things so much easier! i love this – and anything that makes going through the airport checks easier, i am ALL for it. i esp like the multi-purpose aspect of the bag. what a cool company – thanks for sharing this with us! Yes! Let’s stop using disposable stuff! Reduce waste – no more ziplocs. Clearly (a-hem!) 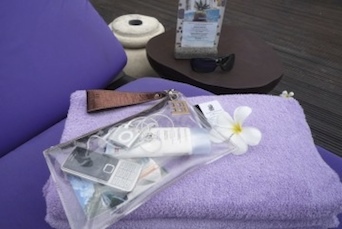 these are a wonderful addition to travel gear – I can easily see my lotions and poptions plus organize my traveling office – everything from paperclips, notes and pens to tech gear and batteries. It’s stylish and classy to protect all our fragile environments! Thank you CAMENAE! This clutch would be perfect to hold all my travel sized liquids and/or all the cords that attach to my tech gear. I will be traveling for an extended period of time and I would love to have easy access and to be able to see everything through the clear bag. I’m a fan on Facebook too! This is a fabulous idea, I have stopped using bottled water and carry my Sigg every place I go. Your new line would have helped on my trip to Peru, so many ziplock bags!. It would be stylish and green for my trip to the wineries in South America, my trip for next year. Thank you CAMENAE!. I’m not sure if I’m eligible to win since I’m not on a career break- but my choice of career means this would be a most useful piece of chic! As an international airline pilot flying around Australasia, the Middle East and Indian Subcontinent, I find myself pulling my manky plastic ziploc bag out of my briefcase at security several times per week! Shamefully, I go through lots of plastic bags every year and would love a beautiful bag that I don’t need to replace and that I can be proud of. Apart from all that- I would be the envy of all our glamorous Flight Attendants! Thanks B2B and Camenae! Rebekah – of course you are eligible – you probably travel more than anyone I know…even though it is for work! Good luck on the contest! Also – CAMENAE is going to be sold in a local Hong Kong store starting this fall…I”ll keep you posted! We have a winner for our CAMENAE givewaway! Congrats to JessieV who wins the eco-friendly CAMENAE travel clutch and will never have to use a ziplock bag again to go through security! JessieV – have fun on your travels!